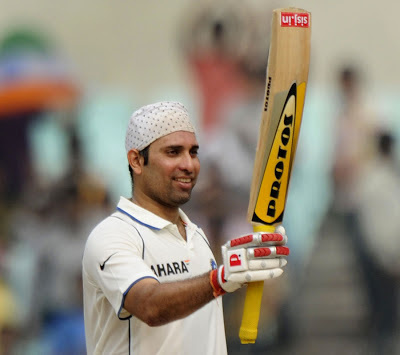 VVS Laxman - a true gentleman, a champion, a saviour and a legend. There are many words to describe this artist from Hyderabad. His ability to rescue his team from hopeless situations made him a special player and that's why even his opponents used to call him 'Very Very Special' Laxman. If you look at his Test record or stats, you wouldn't be impressed a lot. But as they say, sometime stats lie, it doesn't do justice to him and his talent. He played many useful knocks for India, mostly during a crisis situation and 70% of the time with the tailenders. His calm and composed nature sealed many Test matches for India. Sometimes people only talk about big hundreds but tend to ignore those small match winning/saving knocks. Laxman's 73 in Mohali with bad back and 96 in Durban are his two little gems from recent times and are worth as much as any marathon knocks. To be honest, if there was one Indian cricketer who made Test cricket look interesting to me, it's VVS. Not that I didn't like or watch the longer format of the game but as a kid I was more attracted towards ODIs. His 281 against Australia at Eden Gardens was undoubtedly one of the greatest knocks ever in the history of Test cricket and that changed it all for me as a cricket fan and for many of my friends. Australia used to be invincible those days, beating them was a big achievement. India was the only team which challenged them both at home and away. I believe India's journey from an average Test team to a good one began from that Kolkata Test. It gave us a new self-belief that yes we can also beat good sides, no matter what the circumstances are and a big credit goes to VVS. Laxman played an important role in building a Team India in real means and helped in making it a No.1 Test side along with other members of that golden generation which is known as Fab 5. Laxman is the 4th player (after Ganguly, Kumble and Dravid) from that Fab 5 to announce his retirement from International cricket, he has left a void that will be very hard to fill. I will miss his magical wrist work the most. Goodbye VVS. Thanks for the memories.